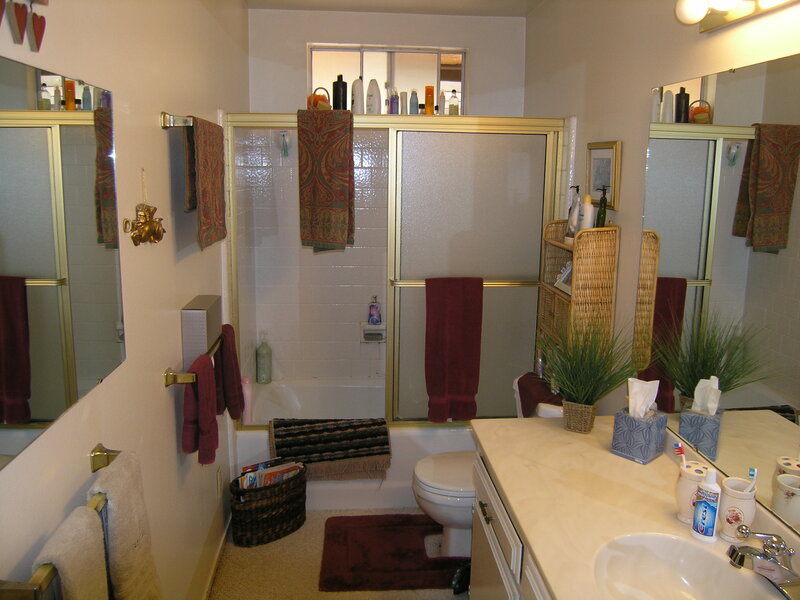 This project is a good example of updating your 1970’s bathrooms. We removed the old Tub/shower door (gold), tile surround, tub/shower valve (chrome), sink faucet long plain mirror and all the old bath hardware. We installed a new pressure balanced tub/shower valve with oiled rubbed bronze trim, marble tub surround with detailed top liner, soap dish and corner shampoo shelf. 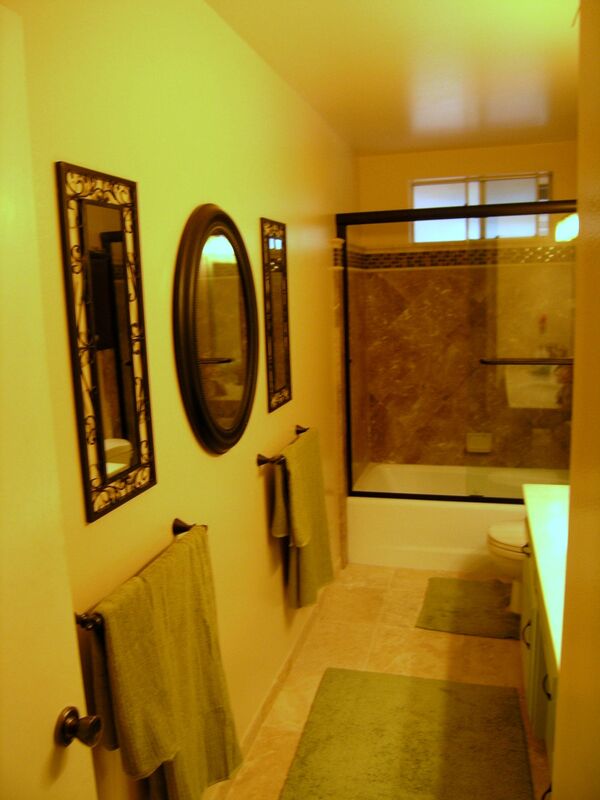 Pillow top travertine floor, oiled hand rubbed faucet, repainted walls to go with the marble, contrasting cabinet color with matching framed mirror and coordinated bath hardware and accessories create a more current feel to this once dated bathroom. This dated kitchen needed a face lift. We removed the ceiling light box frame and fluorescent tube fixtures. With the light box gone we were left with a large recessed area that was one foot higher then the old ceiling. 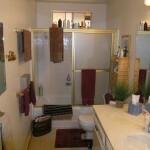 We have done a number of small bathroom updates that are not to expensive. The change is quite dramatic. 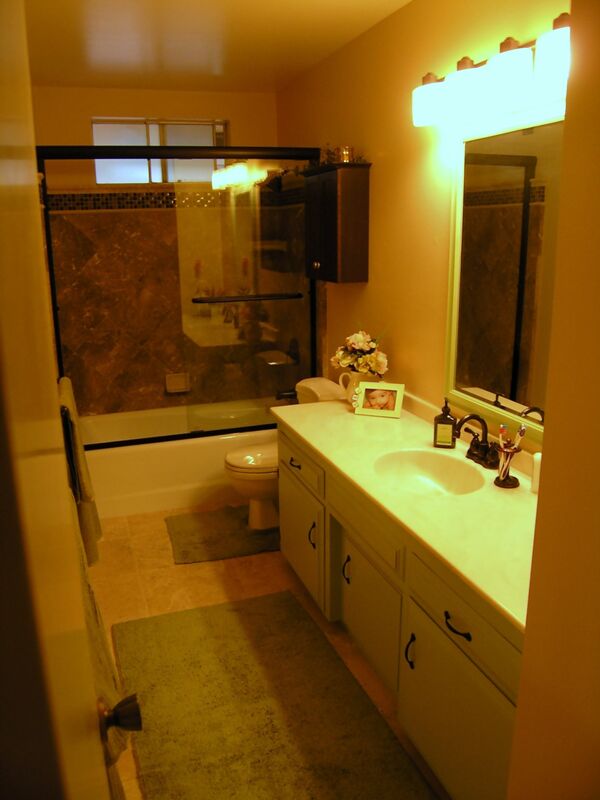 Upgrading your bathroom is a great way to improve the feel of your home. 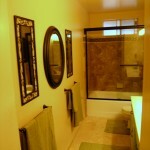 Adding a custom shower, new sinks and counter tops, along with a new floor are all good possible improvements. 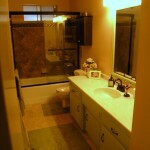 We can do any kind of bathroom remodel you have in mind. You can contact us using our easy to use email form on our contact page at the top. This was a home remodel that added a master bedroom, full bath, and walk-in closet. Highlights of this San luis Obispo home Improvement project were a beautiful tile custom shower, Granite bathroom counter tops, and a wood floor that blended perfectly with the original wood floor.